I finally did it right, and LVNV admitting they don’t have the contract helped. The hearing arrived and LVNV Funding didn’t show up. At the hearing the judge said that he had my motion in hand and asked if I had anything further to add. I told him not to waste any more of the court’s time and that everything I need to say is in the motion. It took a few minutes, and the judge said, that the motion to reconsider is turned into a motion to dismiss on the grounds of failure to state a claim upon which relief can be granted. Case dismissed! I asked him if this could be with prejudice and he said he has to follow the law and give the plaintiff their time to amend. I thanked the judge and that was that. So I got home and checked out what happens next and according to my trial rules, the plaintiff gets 10 days to amend the complaint. 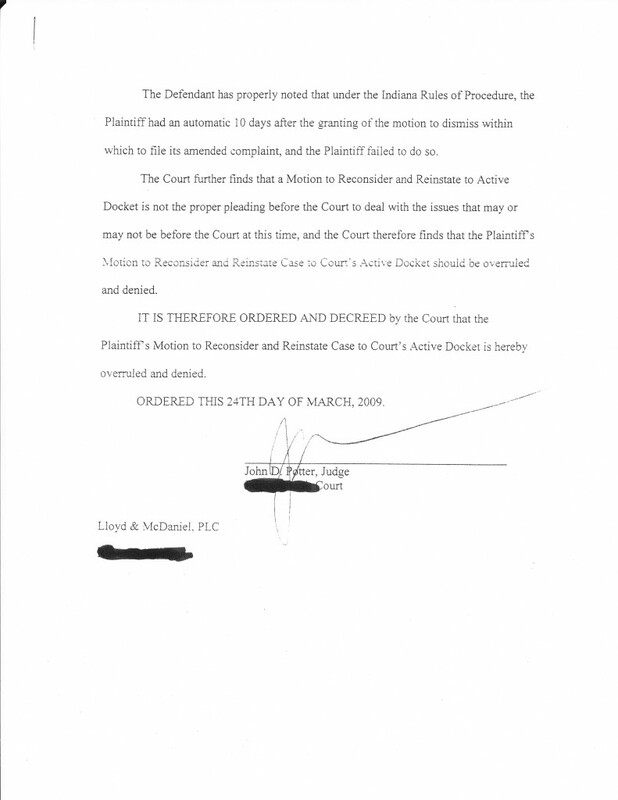 Ten days passed and I received in the mail the plaintiff’s motion to reconsider and reinstate case to active docket. Now these guys were pushing it! In the motion the lawyer claimed that he had a scheduling conflict and couldn’t make the hearing. So they requested the judge reinstate the case and reschedule a rehearing. I was getting smart and knew more about what I was doing. I knew immediately that the 10 days had lapsed for the plaintiff to amend their complaint. I also knew that when the plaintiff submits a motion, you should always respond to it. 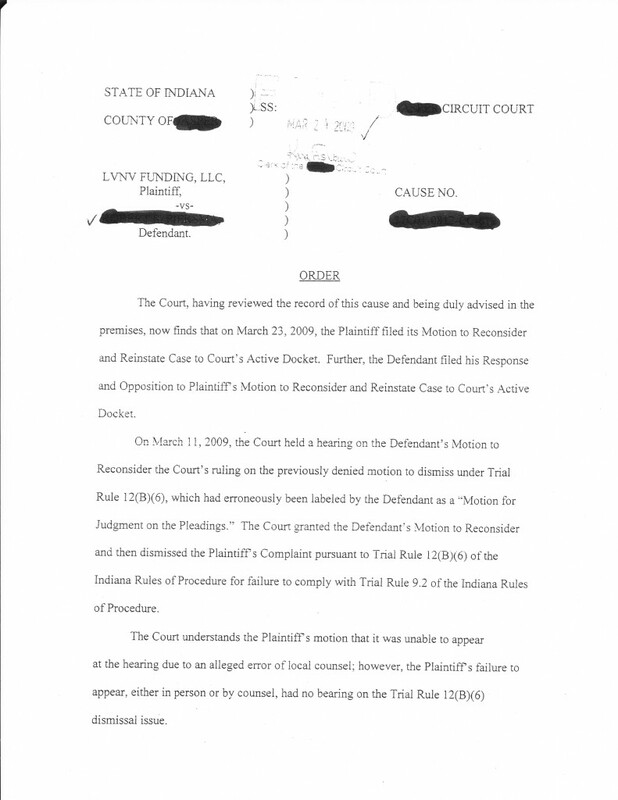 So I responded to that motion and pleaded to the court that when a motion to dismiss is sustained for failure to state a claim under subdivision (B)(6) of this rule, the pleading may be amended once as of right pursuant to Rule 15(A) within ten  days after service of notice of the court’s order sustaining the motion and thereafter with permission of the court pursuant to such rule. The judge said that the plaintiff showing up or not didn’t matter. 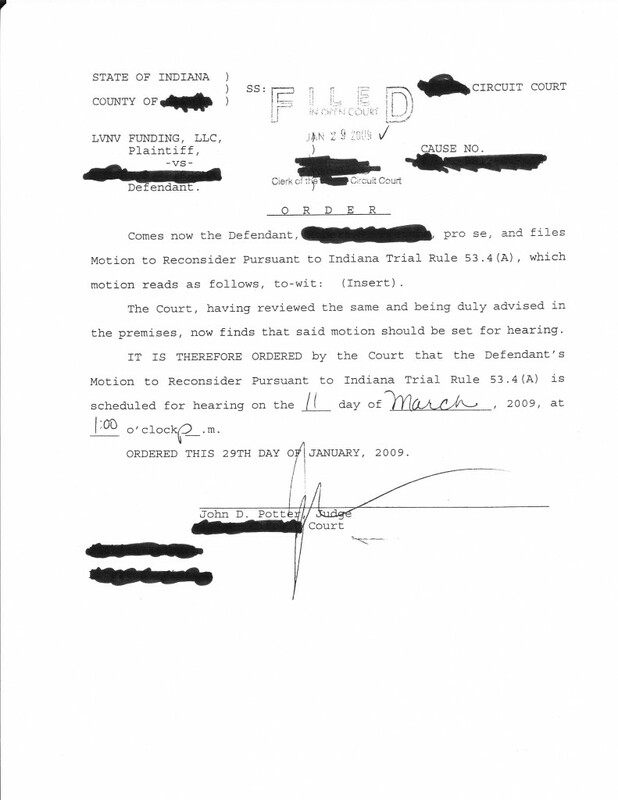 He told them that I was correct and they only had 10 days to amend, and that they had filed the wrong motion. I just beat a law firm the first time around and so can you! (C) Service of pleadings and Rule 12 motions. A responsive pleading required under these rules, shall be served within twenty  days after service of the prior pleading. Unless the court specifies otherwise, a reply shall be served within twenty  days after entry of an order requiring it. If the court grants the motion and the corrective action is allowed to be taken, it shall be taken within ten  days, and the responsive pleading shall be served within ten  days thereafter. If I had read my court rules, I would have known that I could have filed a motion in lieu of my answer. If it had been granted, it would have been finished. If not, my rules clearly state that if the court does not grant the motion, the responsive pleading shall be served 10 days after the notice. So what that means is that if the judge denied the motion, I would only have 10 days to then answer the complaint. (A) When instrument or copy must be filed. When any pleading allowed by these rules is founded on a written instrument, the original, or a copy thereof, must be included in or filed with the pleading. Such instrument, whether copied in the pleadings or not, shall be taken as part of the record. 1. Plaintiff filed a one count complaint based upon a written instrument and did not attach the original or copy thereof. WHEREFORE, Defendant, PRO SE, prays that this court will dismiss this case with prejudice and for all other proper relief. The judge would have granted that, without prejudice and the plaintiff would have to come up with the contract/agreement and it’s highly unlikely that they could have done that. After 20 days of the ruling of the motion, I would have filed another motion to dismiss with prejudice which would have said the above, only adding that they didn’t amend the complaint after having the right to do so. It would have been over. The problem was that I had no clue what I was doing until the middle of the suit. Your Local Court Rules Will Only Help Your Case! First and foremost, if I were sued again, I would look at the complaint and see what is attached. I would then check my local court rules under ‘written instruments’ and in Indiana I would find that a contract is supposed to be attached to the complaint. If there was no contract, I would file a motion to dismiss for failure to comply with Trial Rule 9.2. I would make sure that copies of the contract/agreement were attached to the complaint and that the assignment was also attached. If there was a contract/agreement and NO assignment, I would file a motion to dismiss pursuant to 12(B)(6) failure to name the real party in interest. I have no assignment showing me that the plaintiff has the right to sue me. That would most likely get granted and the collection agency would have to amend their complaint within 10 days and add the assignment. I’d find out that I could file that motion by looking under my court rules for Rule 12. Defenses and objections which 12(B)(6) states failure to state a claim upon which relief can be granted which shall include failure to name the real party in interest. If a motion was granted for not attaching the written instrument, the plaintiff would have to amend the complaint and show the court the contract. If the motion was granted for not attaching the assignment (failure to name the real party in interest), the plaintiff would have to amend the complaint with a copy of chain of assignment. If the plaintiff failed to do so within 10 days, I would file a motion to dismiss with prejudice. The prior motions would only be given “without prejudice” which means the court is following the law and giving the plaintiff their time to amend “without prejudicing the plaintiff” so they can re-sue or keep the suit going as long as they comply. 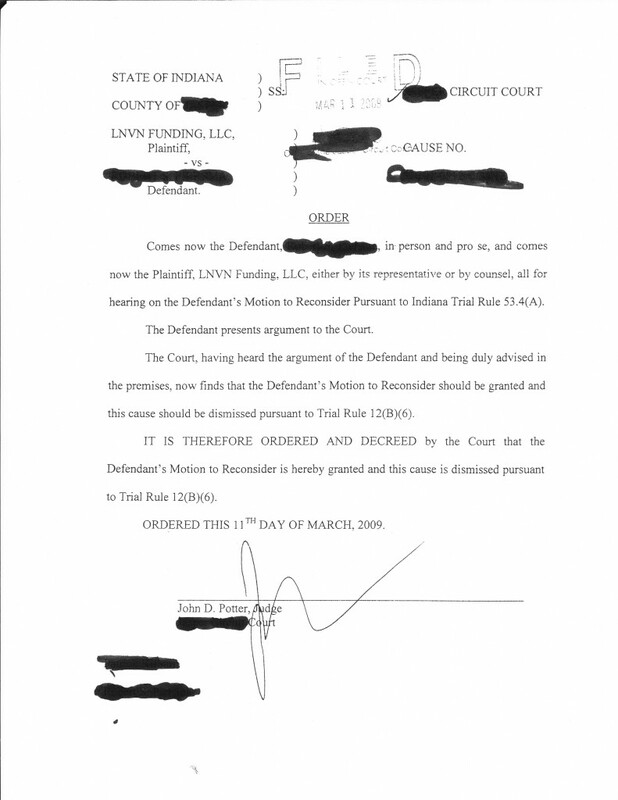 Failure to comply within the court’s allowable time, allows me to file a motion to dismiss case with prejudice because the plaintiff had enough time, according to my court rules, to get the contract or the assignment submitted but failed to do so. Now all of this would have been a lot easier if I had known what I was doing in the first place. There wouldn’t have been any need for a hearing. This case would have been dismissed as fast as they served me. Check out this good read here.